So I was walking around the area of Piazza de Santa Croce in Florence the other day, venturing into a cute side street. That is where Patricia suddenly flew past me on her bike. I just knew I had to stop her and get a couple of shots. Of course she was nice enough to give me the time to catch a good deal of pics! Patricia told me that she is originally from Mexico, and now working as a teacher in Florence. If I got her right she claimed her students don’t think she’s got the style, but I beg to differ. 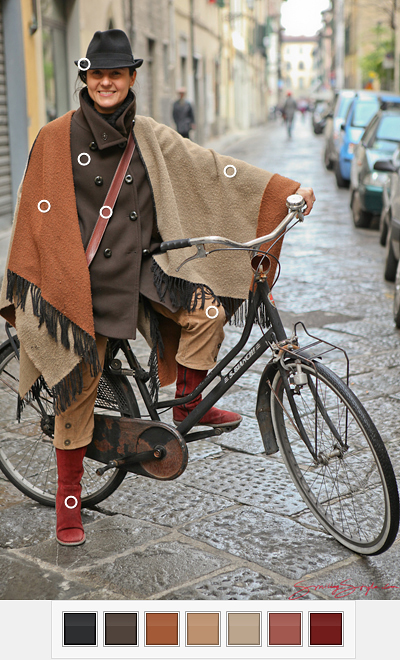 Just have a look at the coordinated earthy colors, the structure of the different clothes and how well they match together with the boots and vintage-looking bike. Absolutely super! Also, a big part of style is the ability to match your outfit to the weather, and still look great. I’ll tell you it was quite cold and rainy in Florence that day. 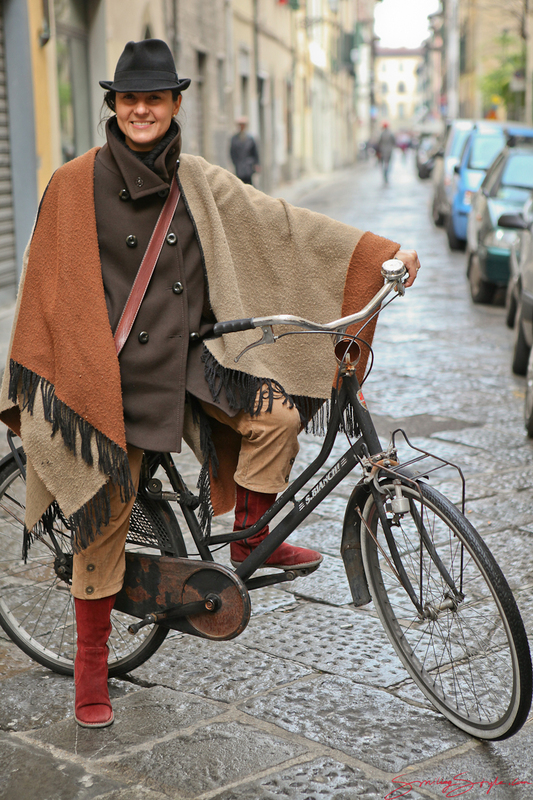 Still, you would expect nothing less of a Florentine lady than looking the part. And Patricia nails that so well – the hat, the jacket and the large cape-ish scarf, all in those wonderful colors. One of the things I love about Florence is that there are almost no plastic or polyester clothes on anyone over there (except on tourists :)). You can indulge the entire day in just watching all those wonderful colors of wool, merino, cashmere, silk, leather, corduroy, cotton et.c. glide past you. And most of the people are very helpful, if you like something on them, just walk up, give a compliment, and ask where they got it. They’ll be happy to guide you to the right shop! ← Older: What a Doll!